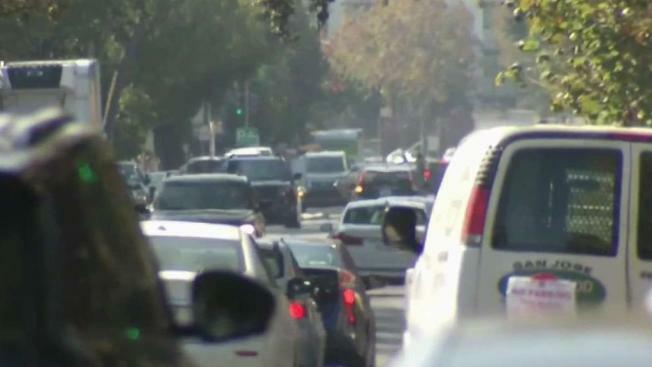 Frustration over gridlock is mounting in Palo Alto. In July, Mayor Liz Kniss triggered an angry reaction when she said traffic is not as overwhelming as people might think. Now, residents of the city’s Crescent Park neighborhood, near Highway 101, are working to change the mayor’s mind, even going as far as conducting their own traffic survey. The results of that poll were being delivered Monday to the mayor as part of a special town hall meeting. In recent years, neighbors in Crescent Park have watched as more drivers, even tech companies' charter buses, start using tree-lined Center Drive as a bypass to University Avenue and Highway 101. They say not only does the traffic congest the once-tranquil street, but it also makes the neighborhood dangerous. "It's gotten so bad, we can't get into or out of our driveways," resident Greg Welch said. "And, god forbid, a fire truck or ambulance has to get through." Other residents say they don't even feel safe walking on the sidewalks during commute hours because several cars have jumped curbs. John Guislin is so frustrated, he conducted his own survey, asking neighbors how they they felt about traffic. Nearly 200 responded. "The top line finding? Eighty-eight percent of them feel there is a serious traffic problem, and 94 percent thought the city is not doing enough to address it," Guislin said. Guislin planned to share the results with the Palo Alto City Council during a special town hall meeting about traffic Monday evening. Welch blames the gridlock on the city's booming commercial development. "I think, unfortunately, the city of Palo Alto development strategies have slowly started to convert this town into a corporate office park," he said. "We've seen a 30 percent increase of new commuters coming into Palo Alto every day, according to U.S. Census data from 2011." But until drivers have better options than taking this detour, Center Drive likely will continue to look like a parking lot. Mayor Kniss declined to comment, saying she wanted to hear from the community first.